Erik Rosillo, a 1st grader at Hempstead Elementary, won the purple laptop in the Purple Paw Contest held during the month of November. On Friday, November 16, HES Principal Samantha Mullens drew a purple paw out of the purple paw box to see who would be the student to take the purple laptop home for the holidays. For the month of November, staff at Hempstead Elementary looked for and recognized students who exhibited exceptional behavior and gave them Purple Paws. The objective for the contest was to collect as many Purple Paws as possible before Thanksgiving for a chance to win the purple laptop. All Purple Paws were turned into the purple box in the front office for a chance to win the purple HP laptop donated by Hempstead Elementary PTO. Erik’s name was drawn from the almost 500 purple paws in the box. 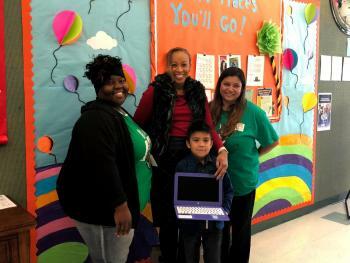 Principal Mullens, along with PTO representative Angelica Cervantez and teacher LaInthia Stubblefield were on hand to present the laptop to Erik. Be sure to watch for the Purple Paw contest during the second semester and another a chance to win a purple laptop donated by the Hempstead Elementary PTO. Remember, the Purple Paw is for exceptional behaviors – Being Safe, Being Responsible, and Being Respectful! Anyone on the campus can give a student a Purple Paw.